As a student on FIRST Robotics Competition Team 86 in Jacksonville, Florida, FIRST Alum Max Goldstein fell in love with the machine shop during his first day on the team and specialized in fabricating aluminum parts on the lathe. 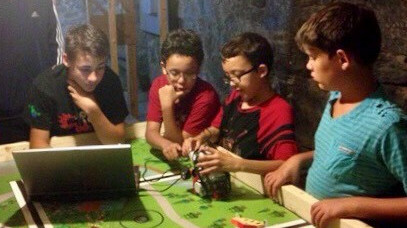 Now a software developer at FIRST Strategic Partner Apple, Max returns to his machine-shop roots and gives back as a mentor for a FIRST Robotics Competition team based at a public school near Apple’s headquarters in San Jose, California. As a mentor, Max is building leadership skills and helping the team learn the importance of setting group expectations to keep everyone working together. 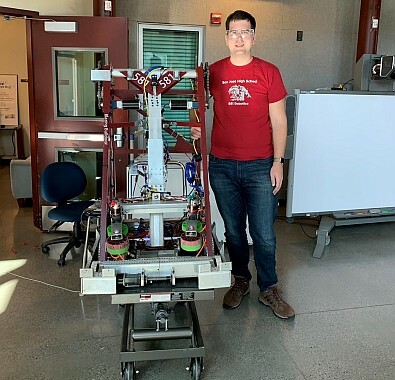 “I try to create a safe environment for failure and the learning that comes with it, while ensuring that we have a functioning robot at competition,” he says. I’m an alumnus of Team 86, where I specialized in fabricating aluminum parts on the lathe. The lead mentor (“Chief Geek” - Florida Regional Woodie Flowers [Finalist Award recipient] ’08; I helped write the nominating essay) had a machine shop in his garage and opened his home to dozens of high schoolers on a weekly basis. This was my first exposure to a machine shop (my white-collar parents previously got as far as explaining flat head vs. Phillips screwdrivers), and I loved it. I remember my second session I poked my head inside the house to find half a dozen programmers sitting around the kitchen tables with laptops, trying to open a file with a different program. After a few minutes I decided that was boring and I went back out to the machine shop and stayed there. I credit my experience with FIRST Robotics Competition in high school with getting me interested in engineering. I went to Tufts University School of Engineering and got my degree in computer science. I investigated mechanical engineering but eventually decided against it. After college, I took a programming job in Baltimore and started with (FIRST Strategic Partner) Apple in San Jose two years after that. One of the biggest challenges I face as a mentor is knowing when to let the kids experiment, fail, and learn, and when to intervene. I try to create a safe environment for failure and the learning that comes with it, while ensuring that we have a functioning robot at competition. It has also taken time for me to feel comfortable in a leadership role and to challenge the other mentors; my first year, I remember the lead mentor focusing on the design of a part several weeks into the build season that we had decided was not essential to our strategy. Setting standards and expectations as a group is a valuable tool to keep everyone working together. In the same way that it’s helpful to document code, wiring, and mechanical designs, communication about who is doing what is essential to your success.